In the first part of this series, we explained how compensatory afforestation is a sham – compensatory saplings are not tracked or cared for, or are planted way outside the city. In this part, we explore why trees are felled in the first place without public consultations. Environmentalists in Bengaluru have pointed out the curious trend of tree-cutting packages awarded in bunches of 49 trees or lesser. Why is this? Section 8 (3)(vii) of the Karnataka Preservation of Trees Act, 1976, stipulates that if more than 50 trees need to be cut for any infrastructure purpose like road construction or widening, Metro rail, buildings etc., permission can only be issued after a public consultation. It also says that the public consultation should be publicised well in advance, through advertisements. But this rule effectively delays projects, as there are bound to be public objections to the cutting of trees en masse. Officials have figured out a way to avoid this situation for sometime – they issue work orders to cut trees in bunches of 49 or lesser. To cut fewer than 50 trees, only permission from the BBMP Tree Officer is needed, and nothing more. This ensures no one comes to know about the tree felling, and the trees are felled before anyone even notices. 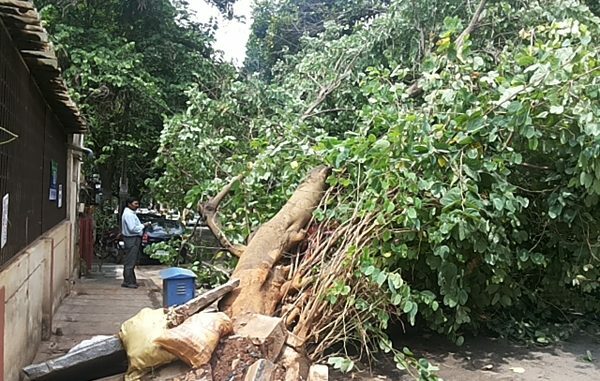 Sudarshan Nityananda, a Trustee of the Bengaluru-based non-governmental organisation Bangalore Environment Trust (BET), says that sometime last November, BBMP contractors cut ten trees on the pavement of the Indian Institute of Management (IIMB). The trees were 40 feet high and could have been transplanted to any suitable site. But, since no public consultation is needed for cutting fewer than 50 trees, these were simply cut down overnight. Later, Nityananda says, BBMP’s Forest Cell claimed that the trees were cut without even their permission, by some “mistake”. Now, it will take at least five years before any tree can be planted on this pavement since Metro construction is going on here, says Nityananda. 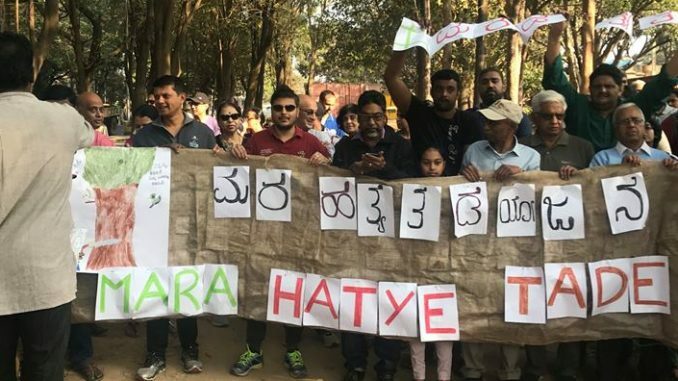 Dattatraya T Devare, environmentalist and a Trustee of BET, had filed RTI applications with BMRCL last year, for details of tree-felling permissions along Metro stretches like Hosur Road. The documents he accessed prove that there were ample instances of awarding tender to cut trees in bunches of less than 50. Another RTI that Devare filed with the BBMP, revealed that the Tree Officer approves nearly all requests for tree felling. The data between April 2012 and August 2015 showed that, of 8195 requests that the Tree Officer received in that period, only 0.9 percent were rejected. And, of the total requests, the majority (5952) were from government agencies. Devare had filed another RTI with the BBMP seeking updated data since August 2015. However, he says the BBMP has not responded to the RTI yet, because of which he has filed an appeal with the Information Commission. Tired of watching agencies circumvent the Preservation of Trees Act to speed up projects, Devare and BET jointly filed a petition in the High Court last year. Respondents in the case are the State of Karnataka, the Karnataka Forest Department, the Bangalore Urban District Tree Authority, BBMP and BMRCL. As we write this, Bengaluru is set to lose another 3700 trees. The Karnataka Road Development Corporation Ltd (KRDCL) has sent a proposal to BBMP’s Forest Cell seeking permission to remove or translocate 3700 trees so as to build the elevated corridors, despite public opposition. Of the 3700 trees, 144 trees are on Bellary Main Road, between Hebbal and Mehkri Circle. And among these, 120 are in the Cubbon Park belt. With upcoming projects like the elevated corridors and expansion of Metro, it remains to be seen if public consultations will be held and tree loss minimised. Three simple steps to maximize capacity of existing roads backed with some number crunching. 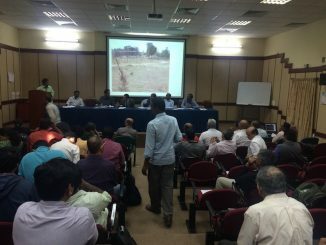 BMRCL came under fire from the public and BBMP at a recent public hearing on tree felling for the extension of the metro lines, as it could not provide proper responses to the objections raised. This is a sad state of affairs. I have been living in Bangalore for over 13 years and have seen it getting worse and can feel the pain of people born here. The problems with Bangalore can’t be solved with just one solution. Lobbyists should experience the problems first hand or someone in their immediate family, only then they will know the impact of preventing things from happening. There were attempts to have waste recycling plants built in the past but the garbage truck mafia would lose easy money so they prevent every attempt and then take all the garbage and throw in the outskirts of Bangalore and near by villages. People are not bothered about water mafia. Once all the lakes get dried up and ground water starts to deplete, then government will wake up and introduce rationing of water hopefully. Automotive companies make financing easier with lobbying, transport players (cabs and buses) lobby with KSRTC to have buses limited, there is no end of these things. I have realised over the years that some people do not have any idea on the amount of damage they are doing to the environment genuinely, while some downplay it for intentionally. There should be an awareness of energy consumption of people living in Bangalore, and kids should be taught in schools how their actions affect the environment. People should be made to understand that course Bangalore is heading towards and instead of reports, media funded by lobbyists, they should look back and see how things have changed. People with kids should wake up and fight for the right of giving a secure future to their kids, rather than adjusting their lives with setting up AC at their homes, dropping them to schools in cars etc. It really baffles me that they are too busy worrying about their families and their kids but do not see the future of the city that their own kids will grow up to live in. I fear for the kids and the new born babies. And I’m scared about the future of Bangalore. The fault lies in planning City Roads.How can we have roads and trees in such a narrow space. Now that flats are permitted in narrow roads and in small sites, there is no space even parking of vehicles and planting of trees. Planning of roads and Metro overhead is the biggest mistake. The Government should have taken Metro underground like most of the European and American Cities. Yes, I agree it is an expensive proposition. Long term development will cost more.For example, London Metro, called Tube is 153 year old and covers a distance of 402 Kms and serves 270 stations, mostly in underground. Now there is no eascape from destruction of greenery if we want to easeup traffic. Old trees should be trans-located. It is a global warming.we should raise a strong alarm against the company using wood. Those are the major users of wood on market. For those companies they have to charged very huge amount. We need more trees in Bangalore. For God’s sake stop cutting trees .